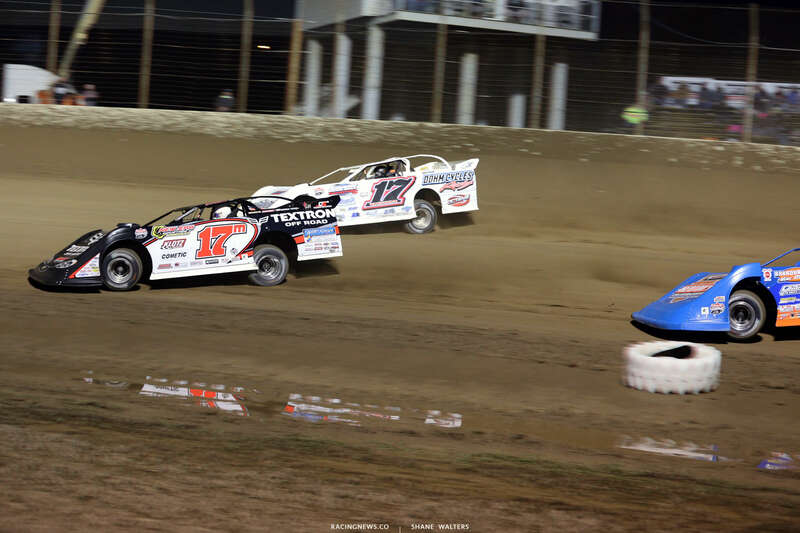 Jason Jameson and RJ Conley line up on the front row in the first heat race of the night. Boggs is pulling off the track before the start! He’s stuck at the track exit. Green, Jameson leads out of turn one. Don O’Neal to 2nd. O’Neal is on the bumper of the leader into turn three. He has a run off the corner. Don O’Neal takes the position. Don O’Neal takes the win in the first heat race of the night! Delmas Conley and Adkins will lead them to the flag stand in heat two. Green, Conley doesn’t get going. He coasts into turn one. The caution is out. Green, Conley leads off turn two. Ricky Thornton Jr is looking for the lead. He takes the position. Conley loses several spots. 1 to go, Satterlee is putting pressure on the leader. He runs within a car length. It’s not going to be enough. Thornton Jr wins heat race number two! Dave Hess and Brian Shirley lead them to the starting line. Green, they run even into turn one. Shirley is on the gas around the top. He powers to the lead off turn two. Lap 2, Dennis Erb Jr is looking for 2nd on the bottom. He got that position. Lap 5, Hess runs wide in turn one. They run three wide under him, Hess loses several spots. Brian Shirley has pressure from Erb late. Shirley holds him off to take the win in heat three! Dale McDowell and Zach Dohm trail the pace truck ahead of heat four. 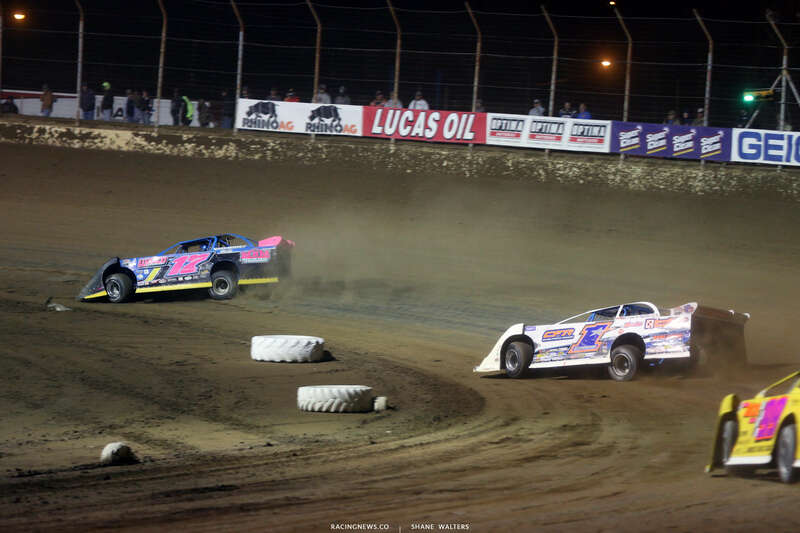 Green, Dohm noses ahead on the outside into turn one. McDowell drives it deep into the corner on the bottom. He slides up the banking and confirms the position off turn two. Green, Moran gets into the loose dirt in turn one. The field drives by on the bottom. McDowell holds the lead. McDowell drives away to take the win. Doug Drown and Mike Marlar lead them to the start in the final heat of round one. Green, Marlar leads out of turn two. Marlar drives off to take the win in the final heat of round one. 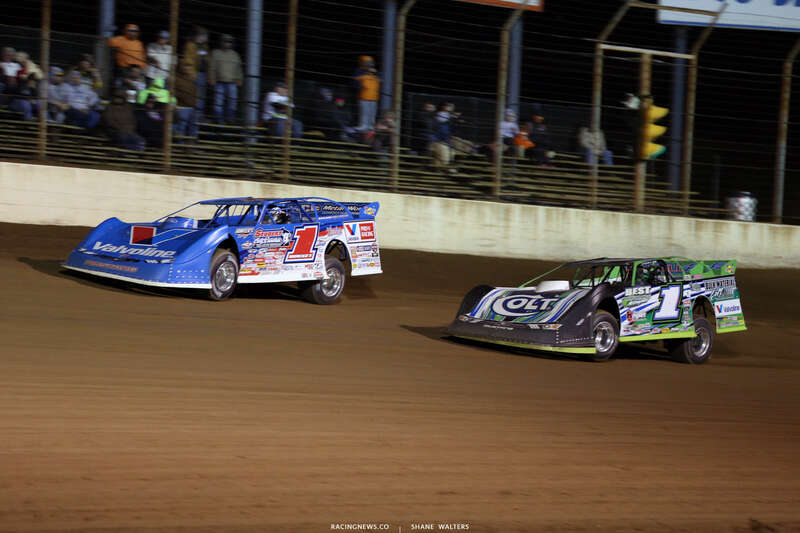 Josh Richards and Brandon Sheppard set the front row. Green, Sheppard and Richard run side by side into turn one. They’re still side by side through the middle. Sheppard prevails, he powers by on the outside. Richards is aggressively looking for the lead. That settles, Sheppard opens up a gap of a few car lengths. Brandon Sheppard takes the win the the first heat of round two! 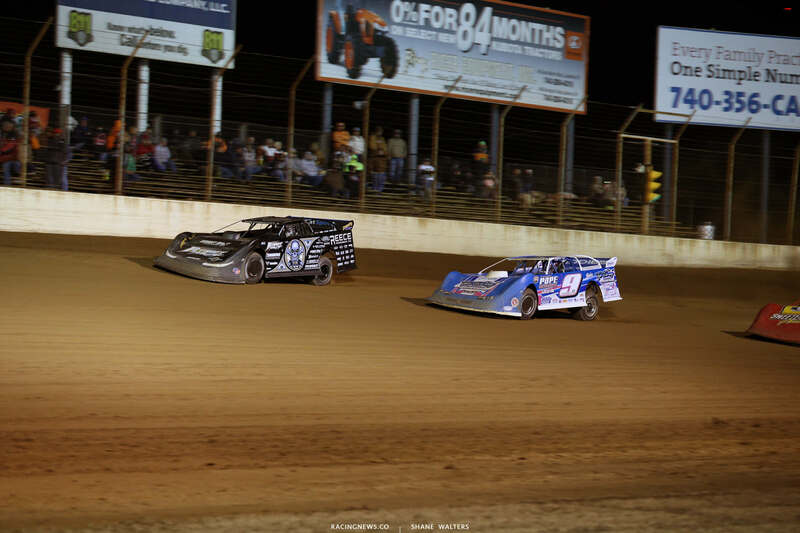 Scott Bloomquist and Devin Moran lead them to the starting line. Green, Moran leads off turn two. False start, caution. Green, Bloomquist is clear before turn one. Moran makes up grown on exit. He tries to cross him off turn two. He can’t complete the pass into turn three. Scott Bloomquist takes the win in heat two of round two! Green, Overton leads off turn two. Pearson runs three wide and in the middle deep in the pack, he’s coming to the front. Brandon Overton takes the win in heat three of round two! Green, Boggs is in the wall hard off turn two. The caution is out. Green, Brandon Fouts leads. Davenport is flying to the front. Davenport climbs to 2nd in a hurry. He’s closing on the leader. Davenport stalls as Fouts begins to open the gap back up. Brandon Fouts wins heat four in round two! Chub Frank leads out of turn two. Thorsberry is looking for the lead. Lap 2, Thornsberry slides Frank in turn 3. Frank looks to the outside, Thorsberry leave the lane open but Thornsberry confirms the lead into turn one. Shannon Thornsberry wins the final heat race of the night at PRP! 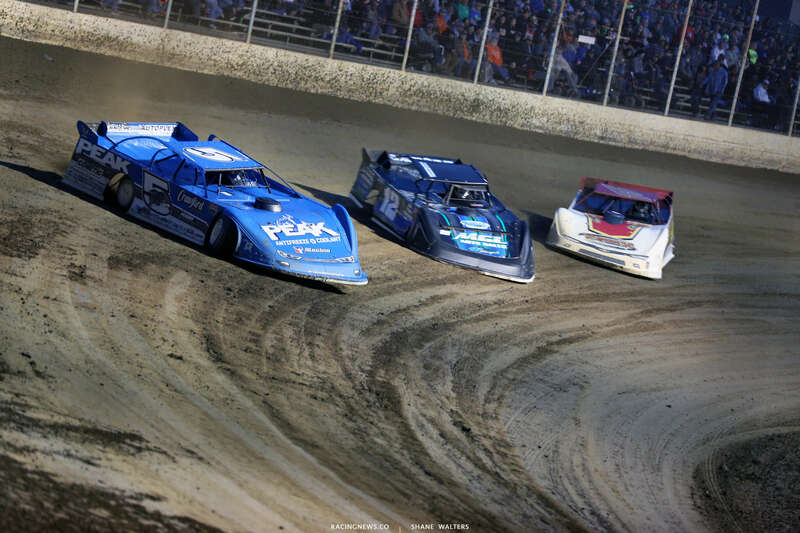 View 2018 DTWC race results below.